Some have seen t his passage as an endorsement of slavery. At the time Paul wrote this letter to the Ephesians, Rome controlled much of the known world, and about 30-40% of people under their power were slaves. It was a fact of life, and this passage is not an endorsement of the buying and selling of human beings. Instead, it was an encouragement to those who were caught in the system to behave in a way that would honor the Lord. Remember, this letter was written to believers. We can assume, then, that there were slaves who attended the church meetings, and who needed encouragement. They were to have respect for their masters, and strive to please them as a service to Christ Himself. 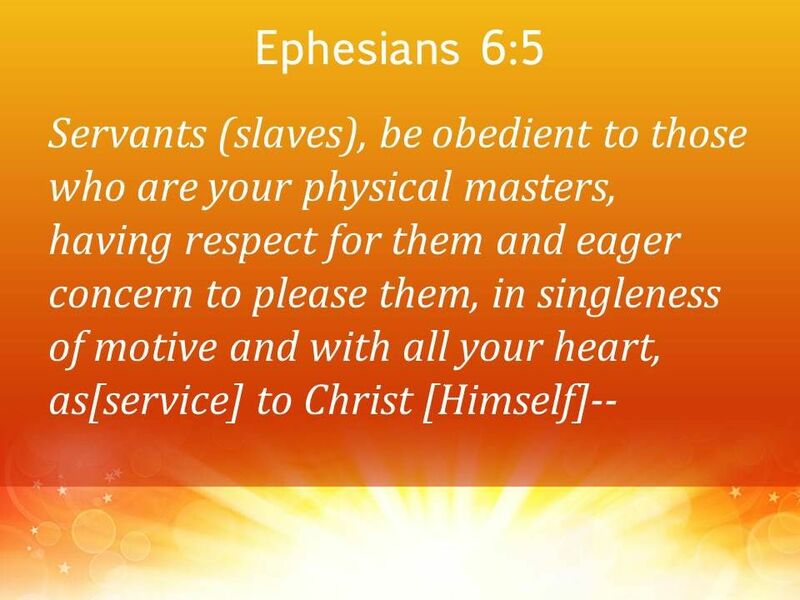 Many slaves were a part of the household of their masters, and had great personal freedom outside of their daily duties It was important that they not abuse those freedoms, bringing reproach on themselves and on the God they professed to serve. It’s a hard thing to be a slave, no matter what freedoms you may be granted. Paul is not endorsing slavery here; rather, he is encouraging those caught in the system to behave with honor and respect. Today, the same encouragement can be offered to employees. We are to give our employers respect, and do our best to please them. Dyspraxia is a learning disability that most of us have never heard of before. Dyspraxic people can have language problems, and sometimes some difficulty with thought and perception. Dyspraxia, is not a matter of low intelligence, although it can cause learning problems in children. Developmental dyspraxia is an immaturity in understanding and performing multi-layerd movement. For instance, a dyspraxic child will not do well at learning to play the piano. There are too many things he must process all at once, and he simply can’t. A person with dyspraxia has trouble planning what to do, and how to do it. 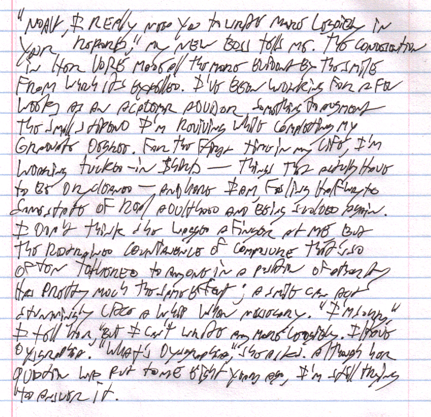 He is overwhelmed by complex problems of physical movement, including speech and handwriting. The National Institute of Neurological Disorders and Stroke2 (NINDS) describes people with dyspraxia as being “out of sync” with their environment. Studies have shown that about 10% of people have some degree of dyspraxia, while approximately 2% have it severely. Boys have it more often than girls . And dyspraxia often comes packaged with ADHD. Daniel Radcliffe, better known to the ancient ones among us as Harry Potter, has dyspraxia. You can read what he has to say about it here. Early symptoms of dyspraxia can include slowness in learning to sit up, crawl, stand up, walk, speak, and potty-train. All of these actions require multiple movements, and a dyspraxic needs more time and maybe some hands-on help to get it figured out. The list of difficulties grows as a child gets older. Shoe laces, buttons, zippers, buckes, snaps–they’re all problematic in varying degrees. Getting dress? Shirts are backward, buttons all messed up, pants unzipped, shoes on the wrong feet and untied. He’s not deliberately messy. He think he did a great job of dressing himself. There is so much involved in dyspraxia. You can read about it in detail on the link I gave you about Daniel Radcliffe. Treatments range from physical therapy to occupational and speech therapy. Some kids have trouble learning not to stuff their mouths, and then they can’t swallow. They don’t make the connection between an over-full mouth and swallowing. They have to be taught to take smaller bites, chew, swallow, repeat. Other therapies include Active Play and even Equine Therapy, which is being used quite successfully for many difficulties in children and teens. There’s something about the horse-human connection that gives a child confidence that he is not just stupid, clumsy, careless, and all the other unpleasant names we tend to label our children with. This is a fascinating field, and I’m getting lost in reading about it. It goes beyond simply having trouble learning this or that task. It is a bewildered child not understanding why he can’t do the things all the other kids do. As Paul continues his instructions concerning marriage and the home, he writes this verse to fathers. I have seen families in which the father takes his role as head of the home to the point of creating such anger in his children that there is no hope of his being able to do the “nurture and admonition” part. As in everything else, balance is the key. Fathers, if your children are constantly angry with you, hurt, intimidated, fearful, hesitant–you are doing something wrong. You are focusing so much on the “I’m the boss” part of your job that you are completely missing the nurturing, the teaching and training in the Lord. The mother is not the only nurturing parent. How I wish that fathers could see the pain they’ve caused in their adult children through their lack of nurturing; through their lack of presence except to discipline; through their selfish determination that the child is ALWAYS to be seen and not heard. Harsh, critical, constantly correcting fathers end up with angry, hurt, distant children. Don’t do that. You have such a special place of leadership in the life of your child. He will always remember your words IF he also remembers that you were not just a father, but a daddy. Why should we honor our parents? Partly because it is the first commandment in Exodus 20 that comes packaged with a promise–a benefit, if you will. To honor our parents gives us the benefit of a good life, and even a long one. Verses like this have always created some controversy, because there have been those who have done their best to honor their parents and yet they have had trouble in their lives, or perhaps even have died without living a full life span. I asked my pastor years ago how we can understand a promise like this one while we know very well that it doesn’t always work out that way. I believe that honoring one’s parents is indicative of a life given over to honoring God as well. We cannot prevent illness or accidents that may shorten our lives, but the over-all sense here is that God honors us for honoring and obeying Him. 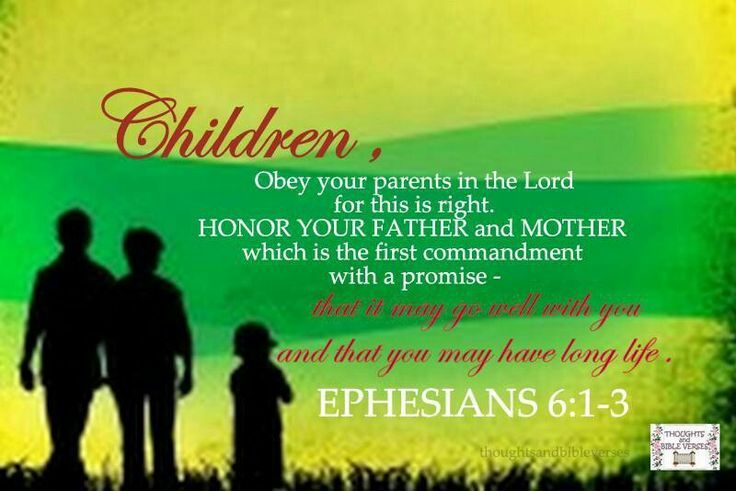 The call for obedience is for little children still in the home and under their parents’ authority. Parents should not demand obedience from adult children who have left the home and have started their own families, because the scripture is clear that a man is to leave his father and mother and cleave only to his wife. We should always rear our children to leave. Even if they don’t marry until later in life, they need to leave the parental home and make their own way. To remain in their childhood bedroom and expect all the privileges of the child is to fail to grow up. To stay on the parents’ insurance until they are 26 is to take advantage of their parents, unless their is some dire physical cause for them to still be dependent. To honor is simply to show respect. To treat with great courtesy, to love and give special recognition to parents who have reared them and followed God’s plan. And the promise is made, in Exodus 20:12 and in the next verse in Ephesians that when we show honor to our parents, our days can be long. That is, our length of years. What about parents who were not godly? Perhaps they were abusive, or alcoholic. Perhaps they continued to try to control their children well into their adulthood, creating problems in the marriages of their children. There are all sorts of ways to be a poor parent. Some of them are criminal. Still, it is possible to respect the fact that they gave their children life. There is no point in being cruel to them. It makes you no better than they are. To ignore them and refuse to have anything to do with them may seem like the only viable solution, but doing so creates a whole new set of problems. There are some cases, if the parents were indeed criminal, in which I would not want children exposed to their grandparents. There is great evil in this old world, and we need to be watchful. But as much as it is possible, there should at least be no overt disrespect shown. We need to remember that our children watch us, and will follow our example. Often, there is the need to simply forgive. There is a story about an old Chinese man who lived with his son’s family. The grandfather was given a cracked bowl, a cup with no handle, and an old crooked table and chair to use during meals. He did not sit with the rest of the family. One day, the grandson asked his father why the grandfather was always given the cracked bowl, the old cup, the rickety chair and table. The father’s answer was that the grandfather didn’t need anything else. One day the father observed his young son carefully washing the bowl and cup, and wiping off the table. “Why are you being so careful with those old things?” he asked. The Greek word for children here is little born ones. indicating children who are young and still under their parents’ protection and authority. And why should little children obey their parents? Well, because it pleases God. Because it is the right thing to do. Because it prevents chaos in the home. The other day I watched a totally frustrated mom trying to control her young son, who was maybe six or seven. He was wiry and strong, full of energy and had a really hard time holding still. They were sitting side by side in a meeting, and he was all over the place. She would grab his arm, his shirt, his hair. Once she just barely caught his foot as he was making his escape. She had him by both arms at one point, and went nose to nose with him, giving him a severe “mommy face,” and saying something I couldn’t hear. He gave the severe face right back at her and squirmed away. At that point he curled up on the floor under his chair, and stayed there for several minutes. It was a reprieve for both of them, and for those of us who could see what was going on. I can guarantee you that nor many years down the road the boy will strike out physically at his mom. She will be visiting him through prison bars, and he will be making demands of her for help getting him out. He will be angry and hateful, and she will be brokenhearted because she won’t have any idea what went wrong. The main thing that will have gone wrong is that God will not have been preeminent in that home. I don’t know if there’s a father involved; I do know that there is no understanding of scriptural instruction in child rearing. While I found the boy’s behavior annoying, I also felt great pity for both the mother and the son. Unless a wise, godly mentor appears, there will not be a happy ending. Even Jesus made Himself subject to Mary and Joseph. 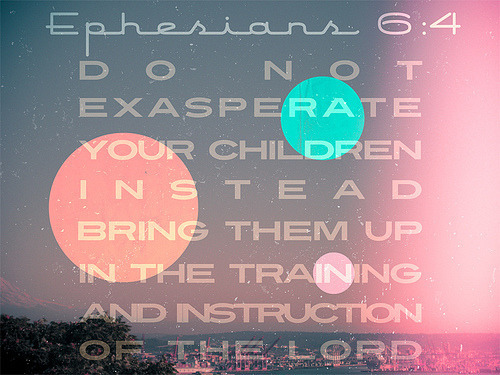 Parents need to learn to command obedience from their children. Children need to be taught the positive rewards to be gained through obedience.